Months ago, Hatsune Miku: Project Diva f was released on PS3. Due to it's good feedback from players, us Westerners can now get the PS Vita port! Yay! I played the PS3 game and loved it. I made it my goal at the time to get 'Perfect' on every song and difficulty, which is usually how I like to play a fun game that doesn't require my memory to remember a story and to come back regularly. I perfected easy and got about two thirds through normal and was pretty proud and hopeful to find a trophy when I was done. 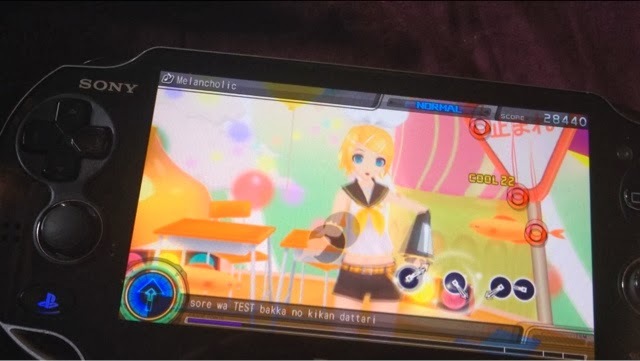 The game is a basic rhythm game with adorable anime Vocaloid characters as your singing friends. If you don't know what Vocaloid is, Youtube 'Hatsune Miku', pick a live video and you'll see she's not a 'real' singer, but she is very popular. Her voice is made of a Vocal synthesiser - a singer goes into a studio and records little bits and pieces of words and sounds and they turn this into this computer vocal synthesiser and program that can be used to create entire songs worth of vocal melody without hiring a singer. Hatsune Miku's character and voice are very well known in Japan and gaining exposure around the world. She's very cute and also has a bunch of cute vocaloid friends. But before every male reading this post runs a mile away, what will be the selling point for this game is whether you like the songs or not. This demo gives a good indication, with three songs from the game. Once you've played through these songs, you will know if this game interests you or not. The game play is simple - you press the corresponding button as it falls onto the button on the screen (terrible description...just look at the photo) and as an added bonus for Vita players, when the stars fall onto the stars on the screen, you use the front touchscreen or back touchpad (demo is front touchscreen only) to swipe these away. Make sure you touchscreen is clean, it helps (note to self: don't play your Vita after eating.). The game looks and plays PERFECT on Vita. The bright colours really pop on the O-LED screen. I actually prefer it on Vita to my TV. Also, it is so perfect for commuting as you can play it in small bursts. The songs range from super bubblegum J-Pop to Soft Rock to Alternative so if you like rock or pop, this game could be worth your while. One thing to note in the demo is your progress doesn't save in the demo so don't get too hung up on Perfect-ing every song. Also, the demo includes four 'modules' (costumes) for the characters, so you can dress them up appropriately for their songs. This demo is great, I would give it a 10 if I was to rate it. But of course, it is only a demo, so if you like it as much as I did, hopefully the game will drop in the next week or so. Hopefully some more money will fall out of the sky for me too as it is not cross-buy as far as I can tell (which makes no sense, but whatever). Let me know if you play it and your thoughts on the demo!